When I tackled horror before, I went for suspense, ie there's something scary and we don't know where it is. Psychological thrillers take on many of the same beats in horror but with one fundamental difference - there's something scary but we don't know what it is. Most films surrounding ghosts explain straight from the off that they are the dead haunting this Earth. 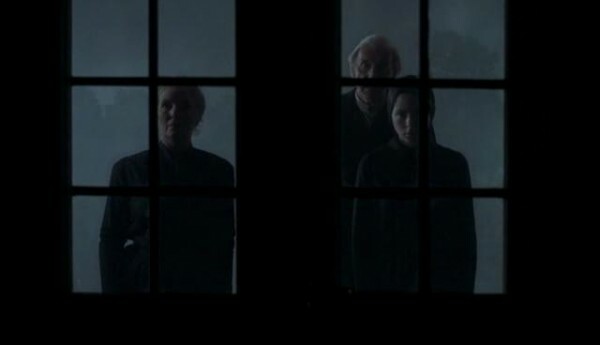 The Others takes care to show us very little in terms of ghostly activity and make clear that the characters interpret it as ghosts, without making the audience go along with them. The Others is a 2001 psychological horror film directed by Alejandro Amenabar and starring Nicole Kidman and Fionnula Flanagan. The film centres around Grace (Kidman) a woman staying with her children in a remote British country house in the immediate aftermath of World War II, fearing her husband was killed after he went missing in action. One day, the servants all just vanished without any notice, so when three strangers claiming to be former servants of the house turn up at the door, Grace lets them in, hoping things will go back to normal. With this film and Abre Los Ojos (remade into Vanilla Sky for an American audience), Amenabar became notorious for his psychological twist endings. If you haven't seen the Others, I will say no more about it, as it one of the few such films that I saw without the ending being spoiled for me and I can still remember my jaw dropping in amazement. But the twist, while a good one, is not the reason to watch this film, it is the perfect way in which horror is set up within it. Most of the scenes are eerie, without any specific imminent threat and that works perfectly. You get the uncanny valley effect - there is something slightly off which, while not specifically wrong or dangerous, makes the hair on the back of your neck stand on end. Amenabar does not try to over explain any situation until it's the right point to do so. So, strange things happen, such as a piano making a noise, only to stop when a door is opened, or the disembodied sounds of footsteps, or things going missing or being placed in different areas for no apparent reason. Most of this behaviour is not threatening in any sense, but without the necessary information to explain it, it becomes really quite terrifying. Once you know the twist, it's worth watching again, because the characters who know give great performances and plenty of hints before the final reveal. In many horror films, directors will go for big effects, scary designs, loud noises and obvious direct threats in attempt to scare audiences, in the Others Amenabar can manage it with a door opening. So, if you want a gothic tale of paranormal activities in the British countryside with true scares and interesting psychological ramifications, the Others is a film you need to watch this Christmas.